A fitness to drive test, after a CVA, at older age, sleep apnea or with various neurological conditions, is generally administered in a clinic. 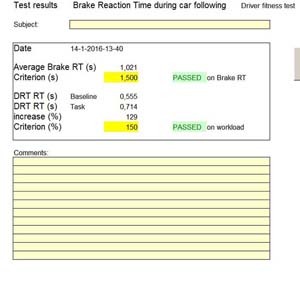 The existing driver fitness tests often lack reliability and validity. Traditional eye tests and tests of urine samples were not intended to be used for testing whether drivers are able to drive a vehicle in a safe way. More importantly, these tests lack validity to be used for the assessment of fitness to drive. As an alternative, on-road tests are sometimes used to test fitness to drive. However, on-road tests are generally not standardized. There are issues with inter-rater reliability, lack of valid criteria for establishing driver fitness, and difficulties to make sure the circumstances are comparable for all test subjects. they can be standardized so the test and all circumstances are comparable for all clients. Thus, driving simulator tests can be a valuable addition to the set of diagnostic instruments to test fitness to drive. Carnetsoft driving simulators offers a set of tests for the assessment of driver fitness. There’s a basic test battery, plus a set of extended tests. We have a low cost one-display version and a mode advanced 4-display version with 210 degrees horizontal field of view surround vision. The differences are listed in the next table. Rendering displays 1, user interface, overlaps rendering surface 3 for rendering (+ 1 for user interface). lateral control: steering and corrective steering actions in response to lateral disturbances (such as windgusts) by using the steering wheel. longitudinal control: control of speed and headway to a vehicle in front, by using the pedals. attentional control: dividing attention between various sources of information. Increased workload generally results in decreased attention to less relevant aspects of the driving task or to information sources that have a lower chance of containing relevant information. Higher workload results in a higher selectivity of attention to the most important aspects of the task. The basic tests are the SteerRT and the BrakeRT tests. In both tests, the Detection Response Task (DRT) is used to measure workload and resulting attention. The Detection Response Task (DRT), was developed by the director of Carnetsoft when working at a research institute (TNO, Soesterberg, The Netherlands). It was then named Peripheral Detection Task or PDT (Van Winsum, W., Martens, M. & Herland, L. 1999. The effects of speech versus tactile driver support messages on workload, driver behaviour and user acceptance. TNO report TM-99-C043. TNO Human Factors Research Institute, Soesterberg, The netherlands). This task has been succesfully applied in numerous Psychological and Human Factors studies into workload and driver distraction, since 1999. This is a secondary task that hardly requires conscious attention and can be done almost automatically by the driver. In the implementation in the simulator software, every 3 to 5 seconds a red block is presented during 1 second on the left side of the middle monitor. As soon as the driver sees the red block, the DRT response button (on the steering wheel) has to be pressed as fast as possible. When the attentional requirements of the driving task increase, DRT reaction time will increase, as well as DRT missed signals. 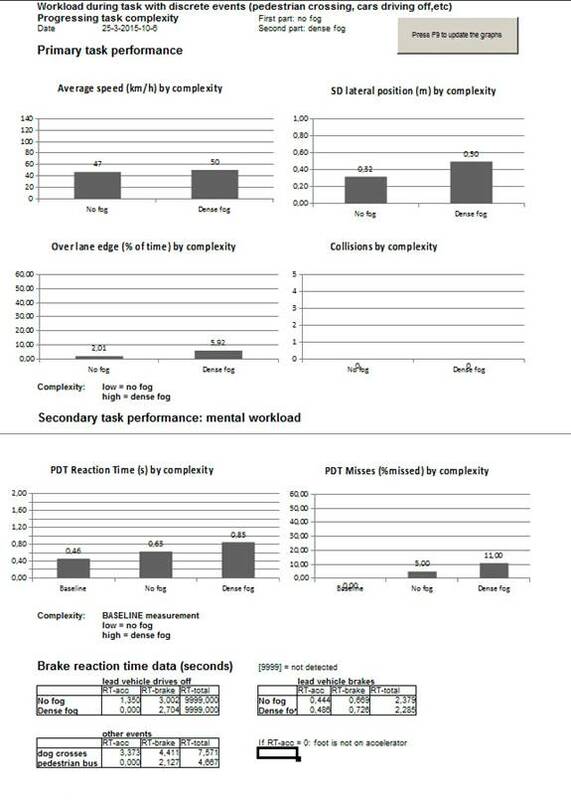 The DRT is a very sensitive test for mental workload. The Steer Reaction Time (SteerRT ) test consists of a long drive on a straight road. The task starts with a baseline measurement of the DRT (detection response task) while standing still. After that, the car starts to drive by itself. The subject is only required to steer and stay within the lane boundaries. In order to ensure forced-paced task conditions, the simulator car pulls up automatically until a constant speed of 80 km/h is reached, and the speed remains constant during 10 minutes. This ensures that task difficulty is the same for all subjects, and subjects are not able to compensate for lower skill level by driving at a lower speed. During the drive, a number of windgusts occur, either from left or right (in random order). After a windgust from left (stimulus) a corrective steering response is required to left in order to stay within the lane boundaries. A windgust from right requires a corrective steering response to the right. A large number of these events happen and Steer RT is measured as the interval between the onset of the windgust and the onset of the corrective steering response. All individual Steer RT’s, around 20 in total, are averaged resulting in an accurate and reliable measurement of steering correction skill. If average Steer RT is below the criterion, the subject passes for the primary task of this test. In addition, while driving, the DRT task is administered. 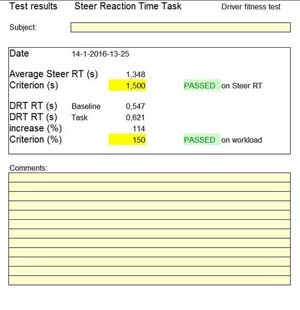 The increase of DRT Reaction Time, with respect to the baseline measurement is an accurate reflection of the level of workload experienced as a result of the steering task. When someone is driving and finds the driving task very difficult, or attention demanding, there’s a higher chance that other information, for example a road sign, a pedestrian that crosses the street, or a traffic light, is not perceived fast enough. This works the same with the DRT. If workload as a result of the primary task (the steering in response to the windgusts) is high, DRT reaction time increases more (with respect to the baseline RT). So, if the subject has to invest too much effort in driving, this is a signal that driving is less safe. For that reason, the percentual increase of DRT reaction time has to stay below the criterion in order to pass. The Brake Reaction Time (BrakeRT) test, also starts with a DRT baseline measurement. After that the simulator vehicle starts to drive automatically on a curved long two lane road with oncoming traffic in the other lane and a lead vehicle in front of the simulator car that drives with a constant speed, but brakes regularly from 80 to 50 km/h. After that the leadvehicle pulls up again to 80 km/h. The simulator car drives automatically and stays at a constant time headway (intelligent cruise control). As soon as the lead vehicle starts to brake, the subject has to take over speed control and has to brake in order to avoid a collision. The subject is instructed to keep the car between the lane boundaries of the correct lane. The interval between the onset of braking of the lead vehicle and the moment the brake pedal is touched, is recorded as the Brake RT. There are around 20 of these, more or less unpredictable, brake events, resulting in a reliable average BrakeRT. If average BrakeRT is below the criterion, the subject passes for the primary task of this test. This test is more difficult than the SteerRT test, because in addition to steering the subject has to monitor the lead vehicle’s behaviour closely and respons appropriately. As with the SteerRT test, the constant speed of the lead vehicle and time headway both ensure that task conditions are identical for all subjects, and the subject can’t compensate by choosing a larger time headway. Because of this, Brake RTs are comparable between subjects and measure the car following and error correction skills in a sensitive manner. Also in this task, DRT is administered during the driving task, resulting in a comparison of DRT RTs while driving with baseline DRT RTs. These simulations are part of the ‘Clinical’ module. To prevent simulator sickness, all drives are on roads where the driver can drive straight on. To make it easier for the driver its best if automatic gear is used. This can be selected from the user interface. – conform to the speedlimit as indicated by road signs. It is important that the client looks far ahead and avoids collisions with oncoming vehicle and objects alongside the road. In this drive, brake reaction time is measured five times in a row. Brake reaction time (BRT) is the time interval between the event that induces the brake action (for example a lead vehicle that starts to brake) and the moment the foot touches the brake pedal. In this test, the criterion for pass/fail is set to 0.90 seconds. This means that when 1 out of the 5 BRT’s is aster than 0.90 seconds, this is judged as a pass. The criterion can be modified by changing the value in the file: \data\brakeRT_crit.txt. The client is asked to pull up to 90 km/h (or the equivalent in miles per hour if applicable). Some time after the moment the speed of 90 km/h is reached, an image of a stop sign appears on the middle monitor. The driver then has to brake as fast as possible until the vehicle is stopped completely. BRT and braking distance are measured 5 times. BRT is measured as the interval between stimulus presentation (the stop sign on the middle monitor) and the moment the brake pedal is pressed at least 5%. Braking distance is measured as the distance driven from the moment of stimulus presentation and full stop. After the test is finished (as indicated by the simulator) this information appears on the monitor of the user interface. This is a 25 minutes drive on a straight road in the dark, so the vehicle lights must be switched on. There’s a constant variable side-wind that gives a realistic steering disturbance. There’s no traffic and the drive is uneventfull which induces sleepiness in people who are susceptible to falling asleep behind the wheel. The task measures susceptibility to falling asleep while driving. The instruction is to drive with a comfortable speed. There are no oncoming vehicles. The drive must stay within the lane edge lines in the proper lane, and prevent collisions with objects along the road side. Number of collisions with objects along the road side. After the test the following information appears on the monitor on the user interface. On the x-as, ‘time-on-task’ is presented as 25 minuts from start to end of the task. The first graph shows the average speed in km/h. People who have to invest more effort in the steering task will generally choose a lower speed to compensate for this, to reduce workload. So, average speed is an indicator of mental effort, or the extent to which the drive is aware of this. When the force of the side wind is higher, people will normally drive slower. That’s because steering becomes harder when side wind is stronger which should result in the choice of a lower vehicle speed. This is a normal behavioural adaptation by which people adapt their behavioural to the safety of the situation. A time on task effect, such as a lower speed when time progresses, can be an indication of fatigue or drowsiness and a behavioural adaptation to this. The second graph shows the standard deviation of lateral position (SDLP). Lateral position is the position of the vehicle on the road (with respect to the right lane edgeline), and SDLP is widely used as a measure for swerving of the vehicle. A larger SDLP means that the driver swerves more. During progressing fatigue or drowsiness, swerving increases, because steering corrections occur less frequently. The third graph shows the percentage of time the lef tor right edgeline is crossed by any part of the vehicle. This is also a measure for quality of steering. When drowsiness or fatigue progresses, the lane boundaries are exceeded more. An increase in the 2nd and/or 3rd graphs indicate progressing fatigue or drowsiness, and indicate that the driver finds it difficult to perform this task safely for 25 minutes. In the ‘’data’’ tabsheet of this spreadsheet other data are stored as well, such as the standard deviation of vehicle speed and the number of collisions. Before the tests 5-WorkloadSteering and 6-WorkloadEvents are administered the client first has to practice the DRT (Detection Response Task, or PDT). The subject practices the DRT for 2 minutes while seated in a stationary (non-driving) car. When the test is fully understood by the client, you can proceed with the next test. 1. Baseline measurement DRT: during 2 minutes baseline DRT reaction time and percentage missed signals are measured. 2. Low complexity: drive with a constant speed of 80 km/h. no oncoming vehicles. Visual attentional requirements are low in this part of the drive. All the driver has to do is drive with a constant speed of 80 km/h and stay within the lane boundaries. DRT is measured during 2 minutes. 3. Medium complexy: drive with a constant speed of 80 km/h while there’s oncoming traffic on the opposite lane. Attentional requirements are a bit higher in this part. PDT is measured during 2 minutes. 4. High complexity: drive with a constant speed of 80 km/h while there’s oncoming traffic on the opposite lane. A lead vehicle enters the road in front of the driver from a parked position, and varies its speed between 60 and 80 km/h. The client has to follow (not overtake) at a safe distance, but must follow the speed of the lead vehicle, and not get behind too much, because otherwise there’s no car following situation anymore. Visual attentional requirements are the highest in this part of the task. DRT is measured during 2 minutes. In addition, average reaction time (RT) and percentage of missed signals on the DRT are stored for the baseline measurements and the three levels of complexity. 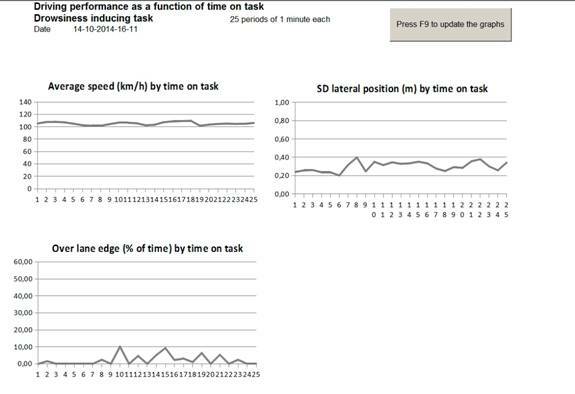 The results consist of two parts: primary task performance (which is driving), and secondary task performance (which is DRT data). In the graphs it can be seen that in the most difficult task condition (oncoming traffic + lead vehicle) RT on the DRTincreases. This shows that workload is highest in that condition. This is normal, however, when RT on DRT and the fraction of missed signals increases strongly, this suggests that the client has difficulties to perform these more complex tasks safely. When in the more difficult conditions, the lane edges are exceeded more often nor when accidents happen, this indicates the client is unable to perform these tasks in a safe way. When average speed in the ‘No traffic’ and the ‘Oncoming traffic’ conditions are much lower than 80 km/h, this indicates that the client has tried to reduce task complexity by driving at a slower speed. – traffic from left and right when approaching an intersections. The road signs determine whether the drive has priority of has to give priority to other traffic. – a woman who crosses the street from behind a stopped bus. The road is very curvy and requires precise steering in a number of circumstances, for example when passing parked cars, or a bus, while there is a continuous stream of oncoming vehicles. The attentional requirements of this task are high. 2. Lower complexity: driving under normal visual circumstances. DRT is measured. 3. Higher complexity: driving under poor visual circumstances with dense fog (low visibility). DRT is measured. In this low visibility condition, the driver has to adapt behaviour by driving at a lower speed, follow at a larger headway and invest more attention into the driving task. This means that workload may increase and this will probably show in the DRTT results. In addition, average reaction time (RT) and percentage of missed signals on the DRT are stored for the baseline measurements and the two levels of complexity. 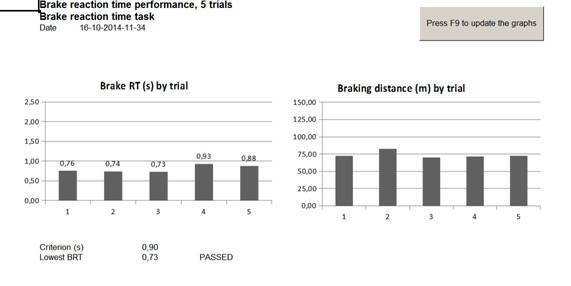 The results consist of 3 parts: primary task performance (driving), secondary task performance (PDT) and brake reaction times for various events. It can be seen that especially in the hardest condition (poor visibility because of dense fog) RT on the PDT increases. 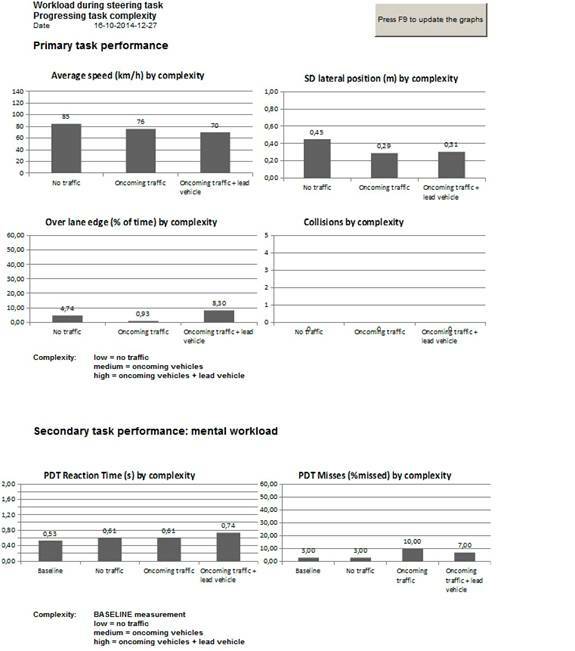 This shows that workload is highest in that condition. This is normal, however, when RT on PDT and the %missed signals increases strongly, this is a strong indication that the client finds it difficult to perform this task on an acceptable level. When in the difficult condition the lane boundary crossings increase strongly or when accidents occur, the client is not able to perform the task in the difficult task conditions, or does not adapt behaviour sufficiently to the increased task demands. During dense fog, the driver has to lower speed and increase headway and pay more attention to traffic, so he/she can anticipate better to unexpected situations (increase safety margins). When the average speed in poor visibility conditions is not lower compared to the ‘no fog’ condition, this suggests the client has adapted behaviour insufficiently to the sight limitations. For the determination of fitness to drive behavioural adaptation to more taxing or unsafe circumstances is a very important indicator. If RT-total is 9999, this means the simulator car has not made a full stop. If RT-brake is 9999, this means that the brake was not pressed. If RT-acc is 9999, this means the foot was already released from the accelerator when the event started. This can be an indication of good anticipation. – A parked vehicle drives off when the simulator car is closely behind it. This normally does not require a full stop. – A lead vehicle brakes unexpectedly. This normally requires a full stop. – Other events: a dog that crosses the street and a pedestrian that crosses from behind a bus. These events normally require a full stop. In the event of the pedestrian the crosses the street, the driver may anticipate by releasing the foot from the accelerator when he passes the bus. These events occur only once, so there’s no comparison of “no fog” vs. “fog” conditions.